Made with Sweet Orange essential oil this deodorant smells amazing. 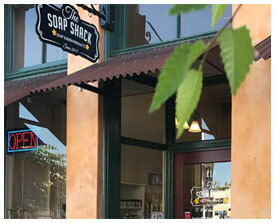 We have formulated a deodorant that we feel is Soap Shack worthy and like all our products a lot of time and effort has gone into making a product that stands out from the rest. We hope that this product will exceed your expectations and keep you smelling soap shack fresh. Unlike commercial anti-antiperspirants, natural deodorants do not prevent you from sweating, rather, it forms a barrier on your skin which gently absorbs moisture and odor. If this is your first time using natural deodorant you may have an adjustment period and you my need to reapply during the day to prevent odor. For even quicker results try our detox underarm lemon sugar scrub to help you transition into natural deodorant. Gently apply to clean dry armpits a little goes a long way. Ingredients: Arrowroot Powder, Argon oil, Beeswax, Cocoa Butter, Shea butter, Emulsifying Wax NF, Kaolin, Sweet Orange Essential oil, Vitamin e.